Submissions are open for the 2017 Connecticut Book Awards sponsored by the Connecticut Center for the Book. The awards include a category for books for young readers, both authors and illustrators, as well as fiction, nonfiction, and poetry. The deadline for submission is April 21, 2017, and the winners will be announced this October. Author must currently reside in Connecticut and must have lived in the state at least three successive years or have been born in the state. Alternatively, the work may be substantially set in Connecticut. Titles must have been first published between January 1, 2016 and December 31, 2016. Authors may enter more than one book per year. Anthologies are acceptable. 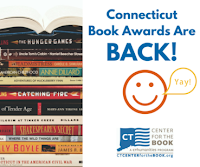 Author(s) must have resided in Connecticut for at least three years of have been born in the state. Alternatively, the works must be substantially set in Connecticut. Books by deceased authors will be accepted only if the author was still living at the beginning of the eligibility year (January 1, 2016). The Connecticut Center for the book is the Connecticut branch of the Center for the Book in the Library of Congress. It is administrated by Connecticut Humanities, a nonprofit affiliate of the National Endowment for the Humanities. Connecticut Humanities highlights cultural and educational events in Connecticut through its website and social media channels and is an advocate for the humanities.